Don't need one old school gameboy is cool. This is really a prelude to a much bigger project. 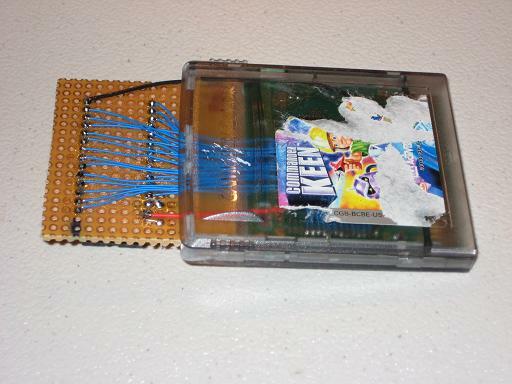 I started out with the desire to have a gabmeboy cart that I could play some of my games that got damage as a result of water/coke being siplt on them. It has turned into a very impressive thing. This is the first stage in which I am getting to know the GB hardware and what it is capable of. For an experiment I wanted to try to get a cartridge that I could program with compiled code to run on the GB. To do this I sacrifieced a game that I didn't like, Comander Keen, and cut the ROM of an wired in a FRAM chip. Here is the finished cart in all its glory. The cart was modified so that the protoboard could be attached to the top of the cart. This is what the back of the cart looked like. This is a good time to mention that a special bit is required to open up the GM carts. The FRAM is a RM1808 from Ramtron. It has the data retention of an EEPROM but with a 70ns write speed if that means anything to you. 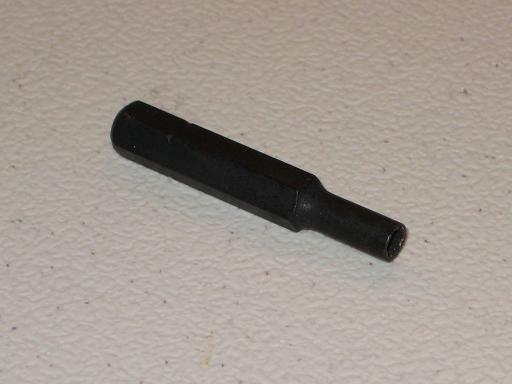 It is used as a non-volitile SRAM replacement. This is a magic bit that is used to open the GB carts. It is used in severel other Nintendo products. There are several places on the web that still carry these bits for a few dollars. I purchased this bit from eStarland. 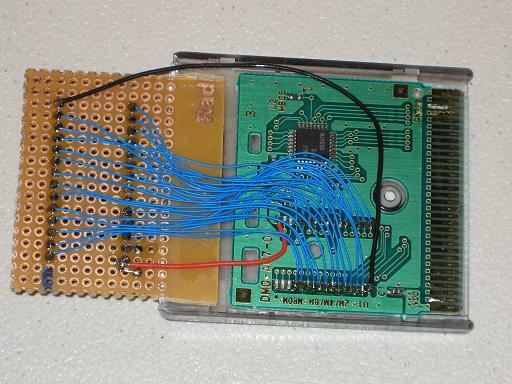 As you can see I removed the ROM form the cart and wired to it. This particular cart actually hade a 2Mbit ROM on it. As I only had a 32kByte part I did not use all the addres bits. Soldering to the pads turned out to be quite a chalenge. This is what the cart wiring looked like that it was done. Pretty good for not having any magnification. The chip that is above the wires is the memory bank controller for the cart. 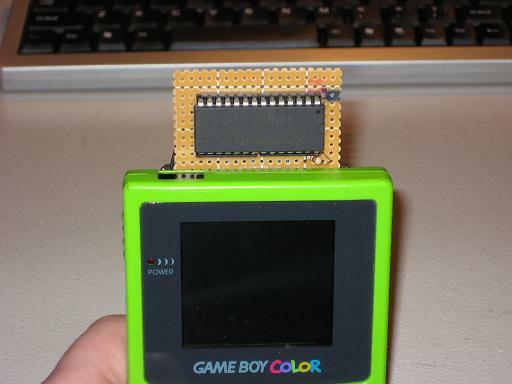 In this case it is a MBC5 which was the last version that was made for the GB/GBC. Learn more about this at the links provided below. 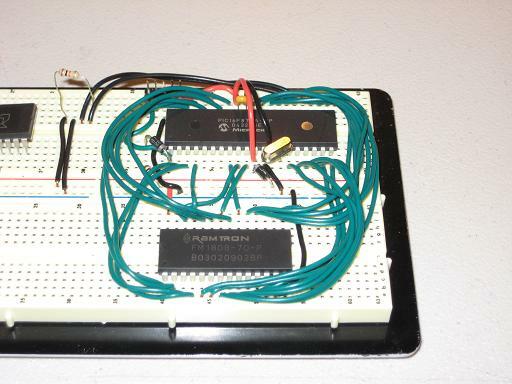 In order to get the data into the FRAM I had to whip up a programmer for the FRAM. 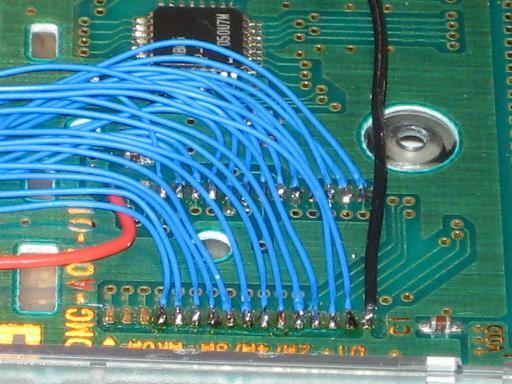 As the FRAM does not require and special sequences or voltages to program I used a PIC 16F877A communicating with a PC over RS232. Supprisingly enough it actually work on the first try. The only thing that I found is that I forgot to tie the write enable pin high so that after a few minutes the cart image would go bad. A simple pull up fixed the problem. eStarland place to find the magic star bit. Pan Docs Here lies the bible for the GB known only as the "PAN DOCS". Compiler C compiler for the gameboy.... what more could you want? 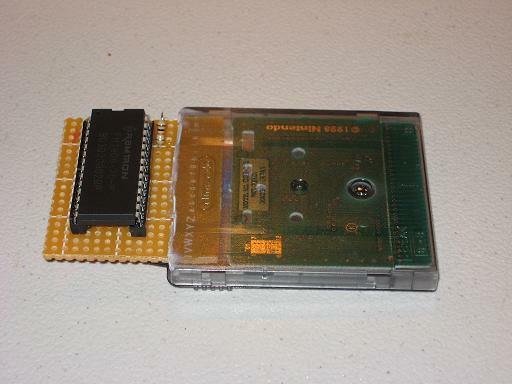 The ZIP file contains the source code for the programmer as well as a c++ app to load the ROM to the cart via RS232. This information is supplied in the hope it may be useful but without any warranty; without even the implied warranty of merchantability or fitness for a particular purpose.